Chances are, you've seen one of her paintings or one of her panoramic photographs and loved it. Deborah Lazar has been creating artwork in Southern Vermont for decades. This month you will be able to see her work in two Brattleboro venues: Vermont Artisan Designs (106 Main St.) and Works Bakery Café (118 Main St.). "I have always prefered painting landscapes from life," said the artist. "Now it is a huge movement in the painting world known as Plein Air, from the French phrase for 'in the open air.' A magazine is dedicated to it." A new art event has sprouted up as a result: the plein-air competition. Artists are juried in, arrive at the designated starting place, have their canvases stamped ... and they're off! Events last from a single day to a week, and at the end each artist may have four or more fresh paintings. The work must be framed, and then those paintings are juried. Most competitions have substantial cash awards. The work goes up "wet" in an exhibition with a fancy reception, which offers artists the opportunity to meet collectors and sell their work. Lazar reported with obvious enthusiasm, "I'm going to Colorado! 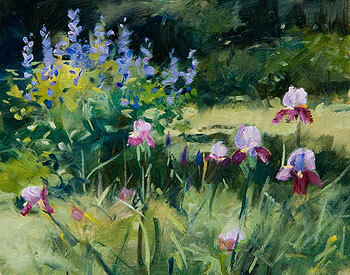 I have participated in several plein-air competitions in recent years. I painted at Plein Air Vermont, which is held in North Bennington, in 2012 and 2013. I have also participated in competitions in Uxbridge, Massachusetts, and Jupiter, Florida, where I have either won an award or sold my paintings. This year I decided to apply to one of the country's premier plein-air competitions, which is held in Telluride, Colorado, and to my amazement I got in! I am really thrilled to have been invited to participate in this event over the 4th of July weekend." Working from life is a welcome challenge for Lazar. Lugging a plein-air studio out into nature is not easy. The upside is working outdoors in natural light and seeing all the nuances of reflected light. Capturing the essence of her landscapes from life, however, could mean painting in the rain or on a hill on a windy day. When painting outdoors on a sunny day, one must work very fast because the light keeps changing. "Sometimes I have a photograph I determine really needs to be made into a painting. Such is the case with 'The Soloist.' 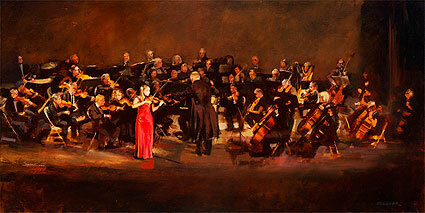 The inspiration for this painting was a photo I took of the Windham Orchestra in 2010. I was struck by the way the young soloist, Elena Yasinski -- the Concerto Competition winner that year -- looked in front of the orchestra, led by Maestro Hugh Keelan. She was playing the violin, wearing an iridescent red dress, and appeared simultaneously vulnerable and competent, alone and accompanied. I have been working on this painting for four years, have painted things in and removed them, trying to achieve a kind of synergism of color and form. I am delighted to have this opportunity to unveil the painting for the first time in public at The Works in Brattleboro. I have enjoyed having it in my studio over these past few years. It has a lot of good energy for me; having it in my studio makes me feel like I am never alone." Deborah Lazar is an award-winning painter who has studied with a number of nationally known artists, including Jeremy Lipking, Susan Lyon, Scott Christensen, and Nancy Guzik. 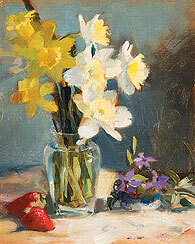 Her work has appeared in American Art Collector and Plein Air Magazine. A member of Oil Painters of America and the Academic Artists Association, Lazar is represented in this year's Academic Artisit exhibit as well as the OPA exhibition in Bennington that opens in June. This summer, as mentioned above, she will be traveling to Telluride, Colorado, and exhibiting her plein-air paintings there.